I have to admit that I was totally intimidated by the idea of buying a motorcycle on my own. After many, many years of practice and the help of the internet, I felt like I had finally mastered the art of car buying. And then I decided I wanted to buy a motorcycle! I was pretty sure the process would be similar to car buying, but I wasn't too sure. So I decided to do a little investigating and came up with a buying plan. I needed to be clear about how I wanted to use any motorcycle I was going to buy. I knew I didn't have a lot of time for long weekend rides, and I certainly wasn't going to go cross-country with the bike. So I wanted something to ride around town and maybe go out on a few hours at a time. I am not a speed freak by nature and wasn't into racing, so I wasn't looking for something that would outrun anyone. I was really looking for something that would put some fun in my day, and might make riding around town more fun. This was a tough one. I didn't really need a motorcycle. After all, I already had transportation. This bike was just going to be for fun. How much could I really afford to spend on fun? 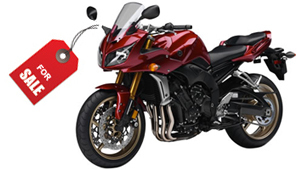 I wanted to set my budget before I went to look at bikes because I didn't want to get sucked in by a good looking bike that I truly didn't need. After doing some checking, it seemed like I would need to start my looking at around $5000 for a new bike and the prices went up from there. The more I thought about my situation and what I was going to use the bike for, the more I thought that a new bike might not be for me. Once I decided on a used bike, I went searching around my area for one. I looked on the online websites where people posted their bikes for sale. I checked around the local bulletin boards. I found a couple of bikes I thought would fit the bill and fit my budget. So I went to try them out. It was tough finding a bike that truly fit. I made sure I looked only at traditional bikes, not specialized bikes, because I didn't want to get in over my head right off the bat. I wanted to give myself time to ease into riding. I figured that if I chose the right used bike, I would be able to use it for a while and sell it again when I was ready to move on. I knew finding the right bike would take some time, and that was time well spent. When I finally found my bike, I knew it was the one for me. I paid the seller, paid my taxes, tag and registration fees, called the insurance company and was ready to hit the road. My first step in hitting the road was to hit the motorcycle refresher course. I was ready to ride, but I wanted to be sure I remembered all the important details that were going to keep me safe. Taking the refresher course was a great idea. Not only did it help me relearn the rules and regulations, it gave me time on the bike to practice and gain some confidence before I really hit the open road.